Find Better Ideas, Faster ® with a custom beauty tech trend report, our PRO Dashboard and 80+ categories of premium trend reports. 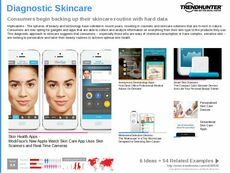 The Beauty Tech Trend Report investigates the products that combine aesthetics with software programs, which includes tech-based beauty aids, video tutorials and wearable skincare devices. This report covers a broad landscape of technological devices that aim to nurture skin and beauty culture. From anti-aging skin devices to nail care and makeup-matching smartphone applications, the market for beauty tech is continuously expanding and this report will provide deep insights into the products that are currently being desired by consumers. Beauticians, estheticians, dermatologists and beauty specialists will be able to use the Beauty Trend Report to better understand existing products and become informed of the demand for innovative tech-base beauty aids and enhancers. This report will also be useful for app and software developers. 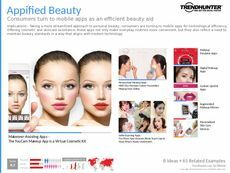 The Beauty Trend Report allows you to use the current trends within the beauty market to advance in this industry.